What Does Being Laid Off Mean? Being laid off refers to a temporary or permanent termination of work contract by an employee because of reasons relating to the business. A company can suspend just one worker or a group of workers at the same time. Another point worth noting about layoffs is that they don’t occur because of the employees’ faults. Often, it’s because the organizationTypes of OrganizationsThis article on the different types of organizations explore the various categories that organizational structures can fall into. Organizational structures wants to downsize or is experiencing issues with personnel management. When workers are laid off on a permanent basis, it is known as redundancy. One of the main reasons why workers get laid off is because the company decides to cut back on costsFixed and Variable CostsFixed and variable costs are important in management accounting and financial analysis. Fixed costs do not change with increases/decreases in units of production volume, while variable costs are solely dependent on the volume of units of production. This guide teaches an analyst the fixed vs variable cost methods in some way. The need can arise from the fact that the company is not making enough profits to cover its expenses or because it’s in massive debt and is unable to settle it except to let go off some employees. When a company decides to lay off employees, it should conduct the process in the right way. Otherwise, it’s likely to fall into more financial problems arising from lawsuit costs or severance packagesSeverance PaySeverance pay is a form of compensation that an employee receives when they are let go by a company. In other words, it is money or benefits that an employer pays an employee who loses their job through no fault of their own. It is frequently required by employment law.. Layoffs also occur when a company needs to eliminate some positions due to over-staffing, outsourcing, or a modification to the roles. A company may want to eliminate redundant tasks in order to make its operations more efficient. If one factors in aspects like new management and a shift in the company’s direction where jobs are redefined, then it’s easy to see that laying off workers is closely related to cost-cutting. 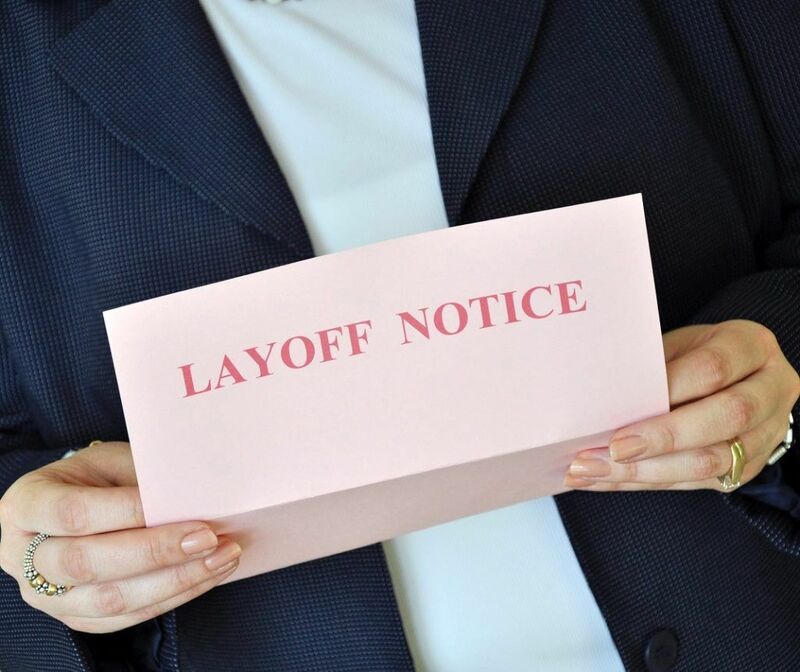 Layoffs cause a considerable impact on the entire company or just a few of the departments. Expanding some sectors like IT and shrinking others like marketing means that some employees will lose their jobs. In such a way, the company is able to accommodate the evolving needs of the growing sectors of the company. Moving the company’s directions from one area to another can also bring about the need to let go of some workers. Shutting down the initial location will not only affect the workers who get retained but the surrounding community’s economy as well. So, if a company is planning to implement massive layoffs, it should show genuine concern for the employees by providing them with resources so as to help them adjust. If a business is bought out or decides to merge with another, the change might lead to a change in the company’s leadership and corporate direction. If there’s new management, the chances are that they’ll come up with new goals and plans, and it can lead to layoffs. In such an instance, the new management will look at every employee’s position, performance, and length of time spent with the company so as to decide who they will lay off. Laying off employees is stressful not just to those affected but also the HR departmentHuman Resource ManagementHuman Resource Management (HRM) is a collective term for all the formal systems created to help in managing employees and other stakeholders within a. In fact, it also affects a company’s image as outsiders are likely to think that the company is struggling to stay alive. So, are there any alternatives to laying off workers? Yes, there are! If a company owner needs to reduce its workforce, why not just ask who wants to step down voluntarily. For example, the owner can offer older workers a retirement package as an incentive. A voluntary retirement program enables individuals to transition to retirement smoothly. Adopting such a strategy benefits the company money in two ways. One, it helps the company owner accomplish his goal of workforce reduction and two, it saves him money since those who retire voluntarily are often workers who earn the most in the company. If a company is laying off workers to reduce costs, it can look for other avenues of saving money. For example, the company managers can freeze additional hiring, reduce or remove bonuses and raises, and eliminate unnecessary travel. They can also postpone upgrades on non-vital equipment. Another way to cut down on costs is to keep only the most important staff onsite and send the rest of the workers home to work remotely. Thanks to modern and capable software, the company owner will still be able to manage his employees remotely by conducting video conferences. A company owner can also save money by offering more unpaid time off rather than eliminating workers’ positions. For example, he can ask his employees to skip work on Fridays or offer them an additional two weeks of vacation during the summer season. In times of financial crisis, many companies find that they need to lay off workers for different reasons. The most common reasons why employees are laid off include cost-cutting, staff reduction, relocation, buyouts, and mergers. However, company owners can choose other options instead of terminating their employees’ contracts. Viable alternatives include offering more unpaid time off, adopting virtual work setups, and cutting back on the extras.